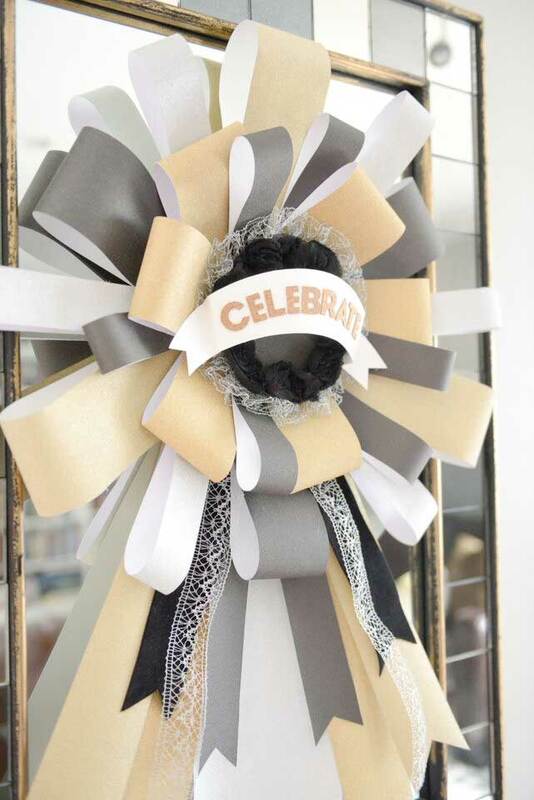 Brighten up your big day with an oversized party ribbon. The ribbon will look like a million bucks, especially as the glitter stays on your project and not on your hands! Cut a cardboard circle for the base of the rosette. Cut long strips, both thick and thin in width, of the glitzy papers. Gently bend the strips in half creating various size loops. Adhere the longest loops to the circle base. Layer the shorter loops on top of the long loops and adhere them in place as well. Cut a circle for the center of the award. Adhere lace to the back, around the edges of the circle. Using the template cut a banner shape. Score and fold the banner on the dotted lines. Adhere letters to the banner, creating desired saying, then adhere the banner to the center of the circle. Cut long, wide strips for the ribbon tails. Cut a V-shape from one end of each strip. Adhere the ribbon tails to the back of the bow. Embellish with lace and fabric ribbon(s). Adhere a ribbon loop to the cardboard circle to hang. Try adding in additional textures to the top or bottom of the rosette (i.e. cardstock, burlap, canvas, etc.). Change up the color to match the occasion for the décor.